Provide comfort for the family of James Shoults with a meaningful gesture of sympathy. James H. Shoults, a resident of Fraser, was received into the loving arms of Jesus on Friday evening under the care of Hospice in Martha T. Berry Medical Care Facility of Mt. Clemens, following a long illness. He was 73 years of age. James was born in Detroit on January 15, 1946, the son of Violet Shoults. He served his country honorably in the U.S.Army during the Vietnam War. 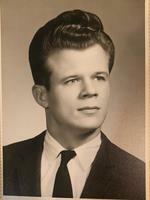 Jim was united in marriage, while in the service, to his beloved wife, Linda Wallace in Detroit. The couple first made their residence in Fort Campbell moving to Detroit, Roseville and finally to Fraser for the past 19 years. Jim was a very work oriented person who worked hard all his life to provide for his family. Early years were many poart time jobs and delivering newspapers, custodial care for Family Affairs and finally for Farmer Jacks Super Markets where he had many managerial positions for over 42 years, retiring at the age of 62. Jim loved the Lord and was active with his church, Grace Assembly where he helped with custodial details. Jim will be deeply missed by all who loved and respected him. Funeral services and burial will be held with full military honors at Great Lakes National Cemetery, Holly, MI. on Tuesday, April 16, 2019 at 10am. Memorial contributions in leu of flowers to the Salvation Army in his memory appreciated. Share memories at www.faulmannwalsh.com. To send flowers in memory of James Howard Shoults, please visit our Heartfelt Sympathies Store.